For 28 years, the Berlin Wall cemented the political division of Germany and Europe. It became a symbol of the Cold War, which split the world politically into an eastern and a western hemisphere. Over one hundred people died attempting to get past the heavily guarded Wall. In the end, the internal and external pressure on the GDR leadership increased so much that a chain of events was triggered that led to the Wall’s coming down (Reagan: 'Tear down that wall!'). On 10 September 2009 the German and Hungarian Embassy and the Clingendael Institute organised the seminar '1989: ACROSS the BORDER'. The event commemorated the historic events of 1989 and their aftermath in Germany and Hungary. It intended to present an eyewitness report from a political perspective and an analysis of the impact of the events, in particular concerning the identity of both countries. Hungarian State Secretary in 1989 presented his views on the historic events. Furthermore, two Institutes of History reflected about the impact of the fall of the wall and the disappearance of the iron curtain on the German and Hungarian identity. The fall of the Berlin Wall took place because certain men and women—people including Pope John Paul II, Margaret Thatcher, Lech Walesa, and Ronald Reagan—took certain specific actions, demonstrating their capacity for reason and courage. 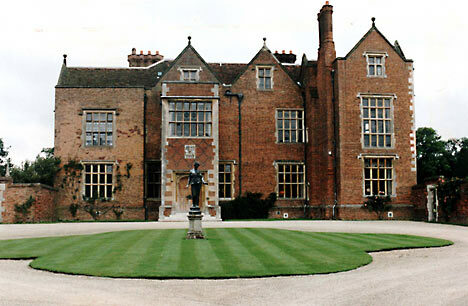 And that, really, is why we study history: to remind ourselves that if those who went before us could do the right thing, then we can do no less ourselves. How the fall of the Berlin Wall and disappearance of the Iron Curtain impacted German and Hungarian identity. 19 Aug: The "Pan-European Picnic" on the Austrian-Hungarian border: 600 GDR citizens flee to the West. 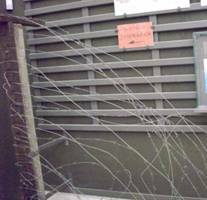 By this time the Federal Republic of Germany's representation in East Berlin and its Embassies in Budapest and Prague are already overflowing and are forced to close. 24 Aug In view of the swelling flood of refugees, Hungary allows all GDR citizens who have taken refuge in the West German Embassy in Budapest to leave Hungary via the Austrian border, and to go from there to West Germany. On 10 September this measure is extended to apply to all GDR citizens in Hungary. 4 Sep The Monday Demonstrations held after the prayers for peace start in Leipzig. The participants call for a new peaceful, democratic order in the GDR. 12 Sep The Polish Government promises all GDR citizens who have sought refuge in the West German Embassy in Warsaw that they will not be sent back to the GDR. 7 Oct The GDR regime celebrates the 40th anniversary of the founding of the German Democratic Republic. Public protests are organized in East Berlin, which are broken up with force by the People's Police. 9 Oct The evening of the key Monday Demonstration in Leipzig. At least 70,000 citizens march past the local Stasi headquarters; the security services decide not to intervene given the sheer numbers of peaceful demonstrators. 18 Oct The Monday Demonstrations and prayers for peace are copied around the GDR. Erich Honecker is forced to resign by the Politburo. 4 Nov More than 500,000 people demonstrate in East Berlin for freedom of the press, freedom of opinion and freedom of assembly, as well as for democratic reforms. At an international press conference, Politburo member Günter Schabowski announces that a new travel regulation is to come into effect "immediately, without delay". The press conference is broadcast live on TV. As a result, thousands of Berliners from the East and West of the city make their way to the Wall. The Berlin Wall was a physical barrier separating West Berlin from the German Democratic Republic (GDR) (East Germany), including East Berlin. The longer inner German border demarcated the border between East and West Germany. Both borders came to symbolize the Iron Curtain between Western and Eastern Europe. 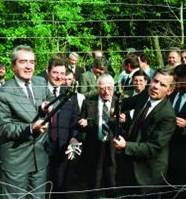 On the 9th of November, 1989, the Border separating Western from Eastern Germany was effectively opened. The following days were most unusual for the whole of Germany - considering the usual German ways, one could almost speak of anarchy: Shops stayed open as long as they wanted (the usual, mandatory closing time was 6:30pm in 1989), a GDR passport served as a free ticket for public transport, and in general there were more exceptions than rules in those days. Of course, Berlin was in the focal point of these changes. The Fall of the Berlin Wall, which will always be used as a symbol for the end of the Cold War, made the "West" available in the middle of the "East", resulting in widespread chaos. Later - much later - normality took hold again. Later, the bickering started, and later, there was talk of a "wall in the heads". But during the November of 1989, almost everyone was overwhelmed by happiness - a national and emotional exception. The wall separated East Germany from West Germany for more than 25 years, from the day construction began on August 13, 1961 until it was opened on November 9th, 1989. During this period, at least 136 people were confirmed killed trying to cross the Wall into West Berlin, according to official figures. However, a prominent victims' group claims that more than 200 people were killed trying to flee from East to West Berlin. The East German government issued shooting orders to border guards dealing with defectors; such orders are not the same as shoot to kill orders which GDR officials denied ever issuing. 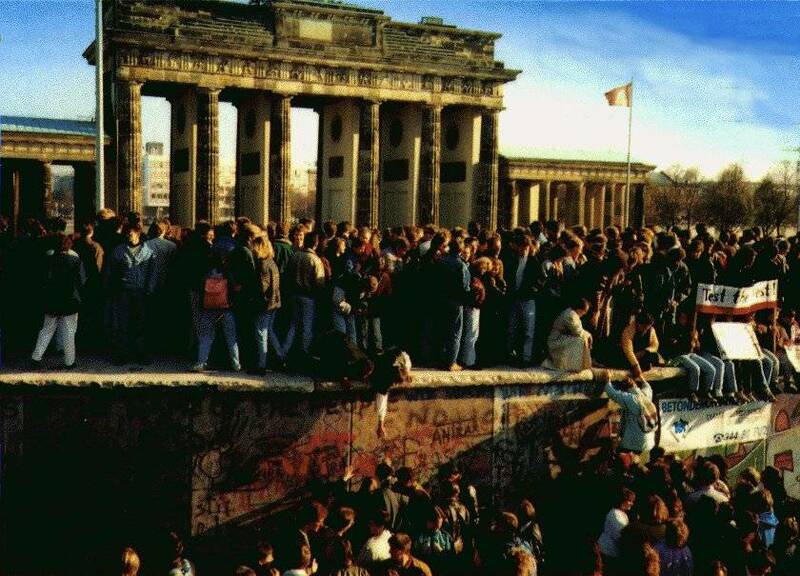 When the East German government announced on November 9, 1989, after several weeks of civil unrest, that all GDR citizens could visit West Germany and West Berlin, crowds of East Germans climbed onto and crossed the wall, joined by West Germans on the other side in a celebratory atmosphere. Over the next few weeks, parts of the wall were chipped away by a euphoric public and by souvenir hunters; industrial equipment was later used to remove almost all of the rest of it. The fall of the Berlin Wall paved the way for German reunification, which was formally concluded on October 3, 1990. John F. Kennedy visited Berlin in 1963. He arrives at Tegel Airport in Berlin and delivers remarks in a welcome ceremony presided over by Chancellor of the Federal Republic of Germany Konrad Adenauer and Mayor of West Berlin Willy Brandt. President Kennedy visits the site of the Brandenburg Gate, looks over the Berlin Wall, and then visits Checkpoint Charlie. President Kennedy delivers an address upon signing the Golden Book at the Rathaus Schöneberg on Rudolph Wilde Platz. In his speech President Kennedy discusses his hopes for the reunification of Germany, and emphasizes the philosophical differences between capitalism and communism, noting, "Freedom is indivisible, and when one man is enslaved, all are not free." In his remarks President Kennedy famously proclaims, "Ich bin ein Berliner." Afterward President Kennedy attends a ceremony at Berlin Free University and addresses the crowd, and finally delivers farewell remarks and departs Berlin. "There are many people in the world who really don't understand, or say they don't, what is the great issue between the free world and the Communist world. Let them come to Berlin ..................... There are some who say - there are some who say that Communism is the wave of the future. Let them come to Berlin ............................ And there are some who say in Europe and elsewhere we can work with the Communists. Let them come to Berlin ................ And there are even a few who say that it's true that Communism is an evil system, but permits us to make economic progress. Lasst sie nach Berlin kommen. Let them come to Berlin .................. Freedom has many difficulties and democracy is not perfect, but we have never had to put a wall up to keep our people in, to prevent them from leaving us .........................."
Ten days after closing the border on August 13, 1961 tourists from abroad, diplomats and the military personnel of the Western Powers were only allowed to enter East Berlin via the crossing point at Berlin Friedrichstrasse. Soon the US military police opened the third checkpoint at Friedrichstrasse. 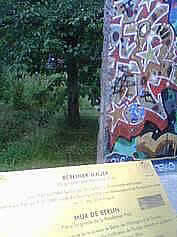 The other two checkpoints were Helmstedt at the West German-East German border and Dreilinden at the West. 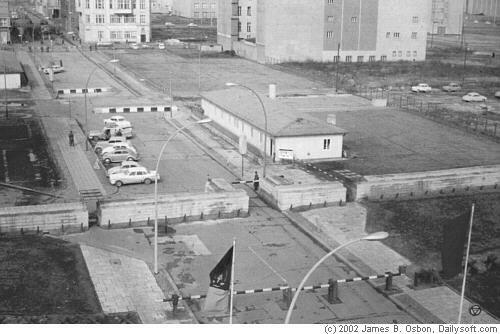 Berlin and East Germany border: Based on the phonetic alphabet the Helmstedt checkpoint was called Alpha, Dreilinden Checkpoint Bravo and the checkpoint at Friedrichstrasse got the name Charlie. The main function of the checkpoint was to register and inform members of the Western Military Forces before entering East Berlin. Foreign tourists were also informed but not checked in the West. The German authorities in West and East Berlin were not allowed to check any members of the Allied Military Forces in Berlin and in Germany. 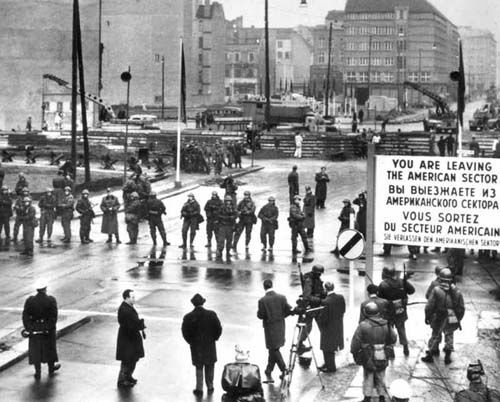 Checkpoint Charlie was removed on June 22, 1990.